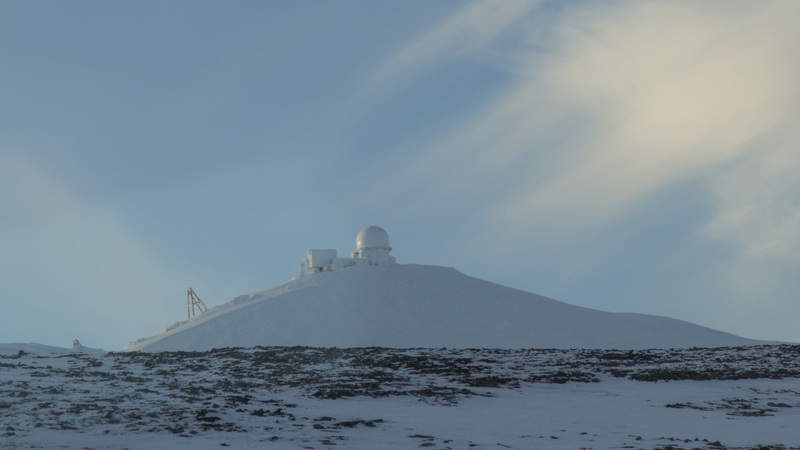 How Climate Change Is Affecting Alaska's Military Radar Stations At the farthest edge of North America, across the Bering Strait from Russia, U.S. military radar stations are threatened by the consequences of climate change. Tin City "top camp." The long-range radar station sits on a bluff 2,275 feet above the Bering Strait, 48 miles from the Russian mainland. Perched on a craggy rise along the western-most edge of the continent a few thousand feet above the Bering Strait sits a sophisticated piece of military technology, ensconced in ice. It's a long-range radar, spinning methodically all day and every night, shielded from the elements by a golf ball-like dome. It probes hundreds of miles of the sky for threats: hostile foreign bombers, planes straying off course, the occasional flock of migratory birds. The radar site at Tin City overlooking Cape Prince of Wales is one of 15 in Alaska overseen by the Air Force. Since the Cold War, they've monitored the airspace above much of the Bering Sea and Arctic. Even with decades of technological advances, the radar system is still the military's primary way of monitoring airspace over a huge swath of the continent. Now, though, this system is confronting a new hazard: climate change. When the radar sites were selected in the 1950s, along Alaska's coastlines and deep in the interior, melting permafrost and coastal erosion were not yet long-term strategic concerns for Defense Department planners. Now, they are a matter of statute. As of 2016, the Pentagon is required to incorporate climate considerations in its planning for operations and infrastructure. A report released this January by DoD found that of the 79 major military installations in the U.S. that were examined, the majority were at a worsening risk of flooding, drought, wildfires and other hazards driven by climate change. That evaluation did not factor in smaller facilities like the one at Tin City, many of which are poised to see destructive impacts from coastal erosion and thawing permafrost in the near future. It's happening more rapidly than Pentagon officials predicted. A contractor clears ice from the door of the long-range radar building at Tin City. In 2007, the New York Times reported that three short-range radar sites in Alaska were closing because, in part, soil erosion was causing the ground to crumble beneath them. A 2014 report by the Government Accountability Office found that the installations are seeing erosion that defense officials didn't expect until the year 2040. Even as the Defense Department acknowledges the problem, there are few solutions for how to cope with it while keeping the radars operational. Getting to Tin City from Joint Base Elmendorf-Richardson near Anchorage, 630 miles as the crow flies, is a trek, even in ideal winter weather. "Our flight time today is just a couple hours," the pilot explained, adding a cautionary note that there are no bathrooms on board the twin-engine turboprop aircraft. "So hopefully everyone will be good." In the early years of the 20th century, Tin City was a small tin mining town. 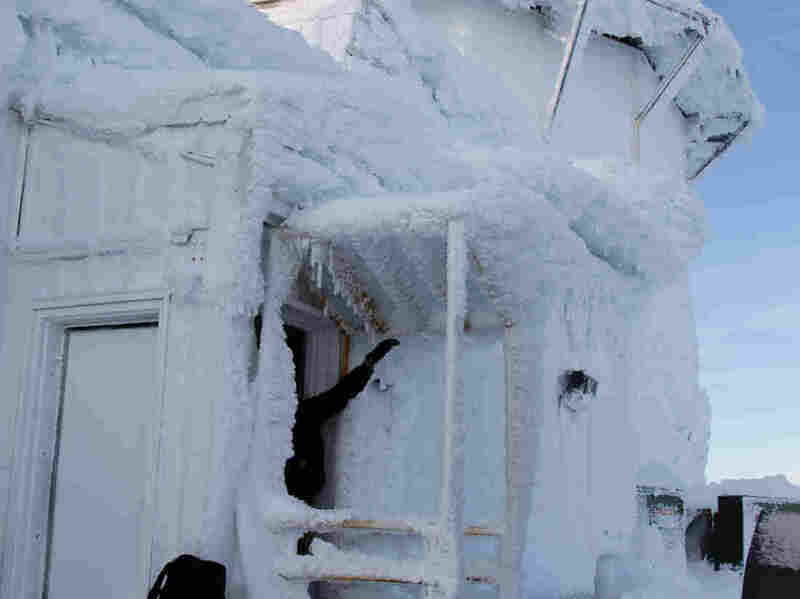 The location is inhospitable, battered by cold winds, hammered by storms and miles from the closest Alaska Native communities, Wales and Shishmaref. Since the 1950s, Tin City has been the site of one of Alaska's long-range radar stations. It used to take nearly 200 airmen to manage these sites, most of them young men (no women or children were allowed) from the Lower 48 serving out one-year hardship posts and doing their best to combat the deprivation and monotony. Over the decades though, automation, improved technology and privatization have whittled down the number of personnel to just four civilian contractors at the Tin City site. Other installations are similar. Some are run by a single person. After landing at Tin City's airstrip, we were greeted by a few pickup trucks. Site technician Tom Broughton gave us a ride up toward the lower camp, where a long, squat building houses employees' beds, cafeteria, workout gear and caches of equipment. "I live here, nine or 10 months out of the year," Broughton explained bumping along a frozen dirt road. When not in Tin City he lives with his wife in southwest Wyoming. Running these radar stations has never been easy, but now, it's getting even less manageable, as coastal erosion nibbles away the land around vital infrastructure supporting the sites. Air Force Col. Daniel Lemon is in charge of remote radar stations stretching from the Pacific to the high Arctic. "I'm a military officer, so global warming? I dunno," Lemon shrugged. He spoke during a briefing about the sites. He was aiming at humility; Lemon doesn't believe his position or background in complex logistics gives him authority to talk about climate science. But Lemon is unequivocal about the diminishing stability of the Arctic environment. "Climate change is happening, and there is erosion going on on the North Slope of Alaska. That's a fact," Lemon said. "I don't know what's causing it, but we have to do something about it, because it's impacting our mission." 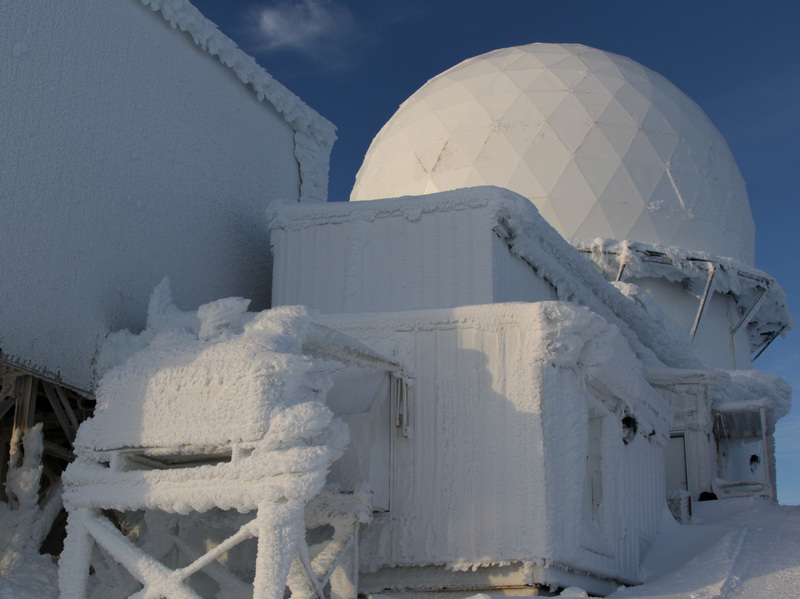 Currently, three of the long-range radar stations operating in Alaska are grappling with climate-driven threats to infrastructure. The installation at Tin City is not immediately imperiled by this issue. However, during our visit in early winter, the Bering Strait was completely free of sea ice, a month later than freeze-up used to get underway. After a quick lunch of cheeseburgers and coffee, a small crew of visitors and techs headed to "top camp," 2,275 feet up a steep mountainside where the actual radar sits. Until recently, workers made the ascent in a tram-car, the metal cables routinely hampered by thick ice. Now, the technicians crawl up the snowy switchbacks in a bright red treaded machine called a PistenBully that looks like a cross between a bulldozer and a tank. Radar technician Jeff Boulds at the Tin City radar site. Driving the machine was our guide, Jeff Boulds, a mustachioed Montanan with graying hair trickling down to his shoulders. In spite of the 16-degree weather, he wore only a sweatshirt for outerwear, noting things had gotten more pleasant since the 65-mile-per-hour winds from a few days earlier had died down. Boulds isn't in charge of the radar equipment itself. Instead, he maintains the sites' facilities. "That's everything from the toilet to the runway, and everything between that," he explained. Most of the contractors have backgrounds in either the oil industry or military. Boulds's last job was at a discovery well on the North Slope, and he is unphased by the solitude and pace of work at remote radars. During the Cold War, sites like this were advanced monitoring stations that could detect Soviet bombers. Tin City is only 48 miles from the Russian mainland, though on this particular day clouds obscured the view. But Big and Little Diomede islands were in plain sight, one belonging to the U.S., the other Russia, the International date line running invisibly between them. The far-flung sites feed signals back to bases elsewhere in Alaska and the Lower 48, messages the military says are a vital part of maintaining air sovereignty. In the decades since the end of the Cold War, more information is passed along to civilian agencies, which in turn split costs for the costly installations. In spite of the comparatively mild winter, the radar building looked like it had just weathered a terrible storm, with ice and wind-strafed piles of snow hanging on every metal surface at improbable angles. A technician used his hand to clear icicles off the front entryway. Last winter, the site was battered by storms, which heaped dozens of feet of snow on top of the building. Lemon chatted with the site techs about how extra personnel flew to Tin City just to dig a path into the radar station with pickaxes. Inside, most of the equipment is classified, Boulds told us flatly. The two floors are filled with what look like lockers and metal filing cabinets, flooded with fluorescent lighting, giving the impression of an accountant's basement more than a high-tech military site. Even in mid-November during a relatively mild early winter, ice clings to the structures housing the long-range radar at Tin City. Though the contents of the radar station have changed as the technology shrank from enormous vacuum tubes to micro-chips, the physical building itself has not. As Boulds led us up a metal flight of stairs, the room filled with a high-pitched oscillating hum. "That's the radar turning up there," he said, pointing to a dark hole in the ceiling. The military's plans for adapting to a warming Arctic while maintaining this capability are far from clear. Already, the Pentagon is spending big to slow down impacts from climate change at other radar sites. According to Lemon, at the Cape Lisburne site more than 200 miles north near the community of Point Hope, waves from the encroaching Chukchi Sea were washing over the airstrip. "So we have a $47 million sea-wall project, they're actually building a seawall to protect that runway," Lemon said. Those tens-of-millions of dollars will protect one runway at one site. That's on top of the $254 million the Defense Department already has budgeted for maintenance and improvement projects over five years. Those costs do not fall solely on the Pentagon. As numerous federal partners have begun collaborating with the Air Force, they have chipped in funds. The Federal Aviation Administration pays 41 percent of the costs to maintain the sites. Seawalls to buffer vital infrastructure are likely just the beginning. Cape Lisburne was, in several ways, low-hanging fruit: A runway close to the ocean, with a quarry on-site to gather rocks for the seawall. Some northern sites will need boulders and armor rock barged in to fortify coastline. 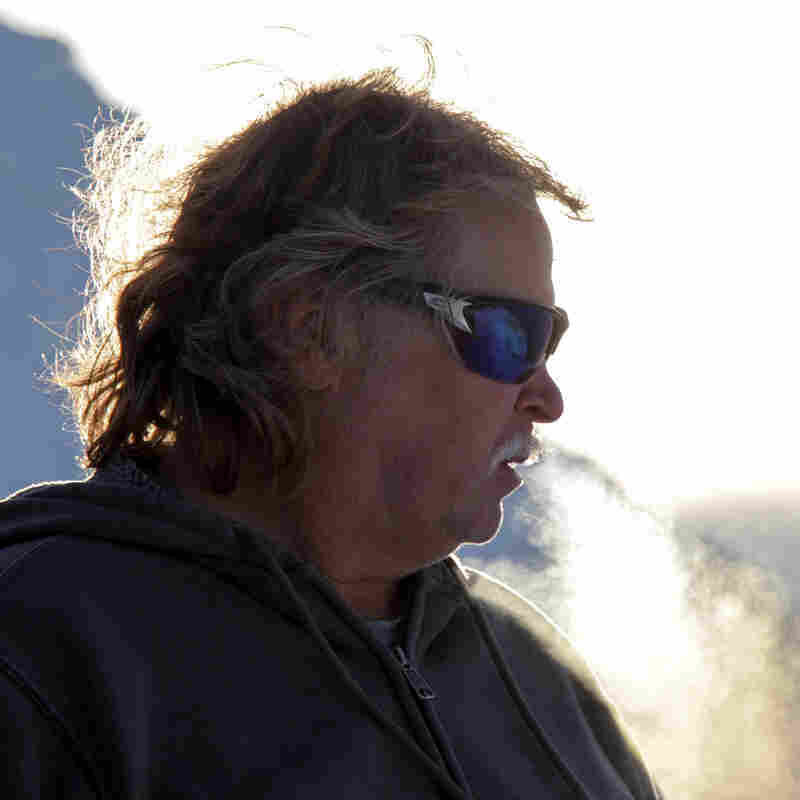 Others will have to figure out how to deal with thawing permafrost. While the military acknowledges the problem, so far it has confronted the threat by emphasizing collaborative planning with other stakeholders. As of yet, there is no long-term strategy beyond keeping the radars spinning.